'Nowhere is safe in Aleppo' Jump to media player A BBC team witness the devastating effects of air bombardment on Syrian civilians after gaining rare access to rebel-held areas of Aleppo. When Syria's jewel still shone Jump to media player Aleppo was once described as "the jewel of Syria" - BBC archive footage from the 1990s shows the city before the destruction. Syrians flee barrel bomb attacks Jump to media player The Syrian opposition has called on Russia to restrain the Syrian regime following the sustained use of barrel bombs in civilian areas. Amateur video 'shows Aleppo attack' Jump to media player Syrian government forces have killed dozens of civilians in air raids in the northern city of Aleppo, activists say. Syria and rebels 'go face-to-face' Jump to media player Syria's opposition and government will meet "in the same room" in Geneva on Saturday after the first day of a peace conference ended with no direct talks. Imogen Foulkes reports. 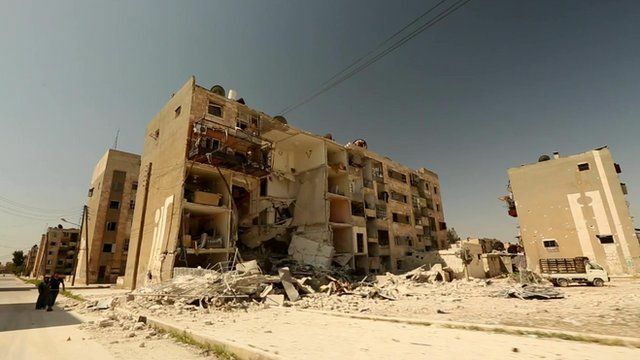 A BBC team has witnessed the devastating effects of air bombardment on Syrian civilians after gaining rare access to rebel-held areas of Aleppo. Thousands of people are reported to have been killed or maimed in a campaign of aerial bombardment in northern Syria this year. The BBC's Ian Pannell and Darren Conway are the first Western broadcasters in rebel-held Aleppo this year.